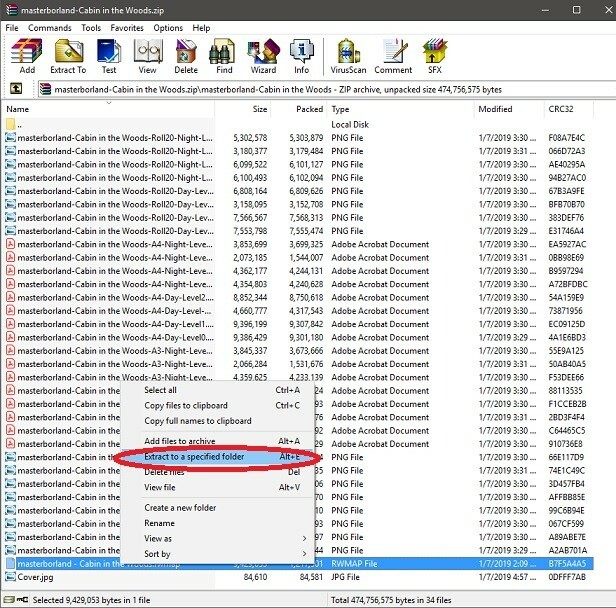 What are the minimum system requirements for the Masters Toolkit? Currently we support Paypal only. 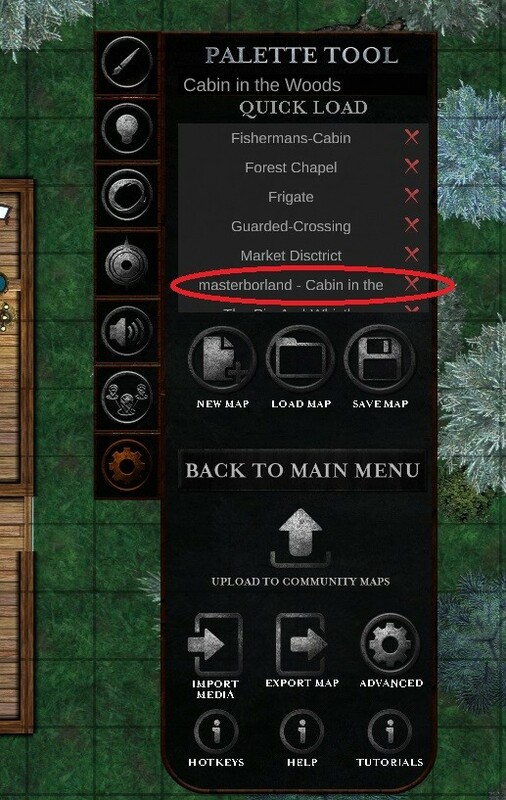 How to use Community maps within the Software ? Step 1 : Purchase community uploaded maps – click here – they are all free. 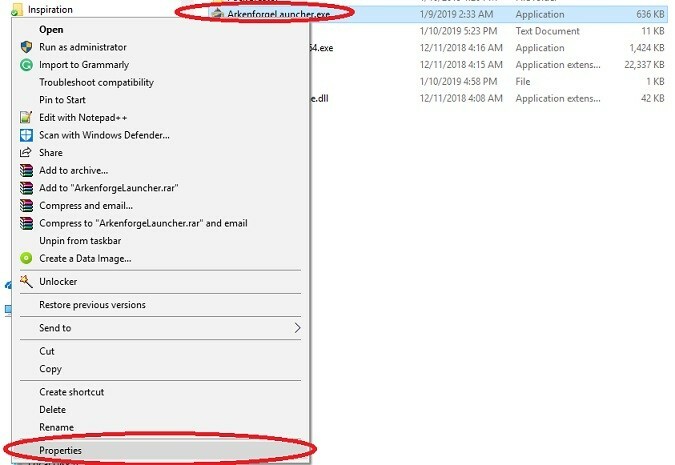 How to reinstall the Master’s Toolkit ? How to install the Master’s Toolkit ? 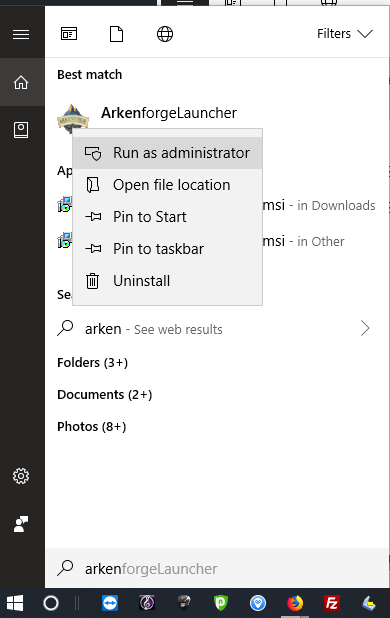 Step 2 : Purchase and download the installer for the Windows launcher from our website here: https://arkenforge.com/product/masters-toolkit-alpha-version/ . If you have purchased the product and downloaded the installer but havent installed for about a month or so, we suggest re-downloading the installer, because as we update the software, we also updtate the installer, so you dont end up waiting a long time downloading small patches. 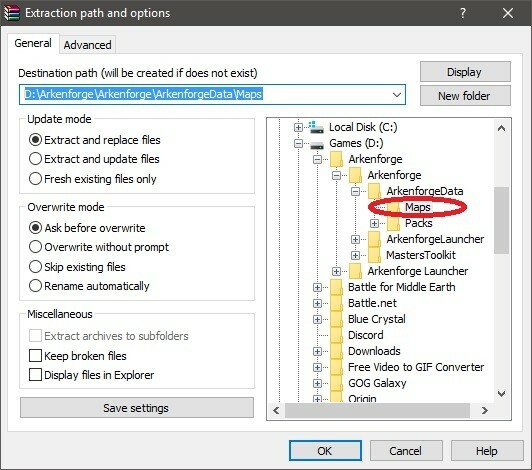 To download the installer again, head to : https://arkenforge.com/my-account/downloads/. 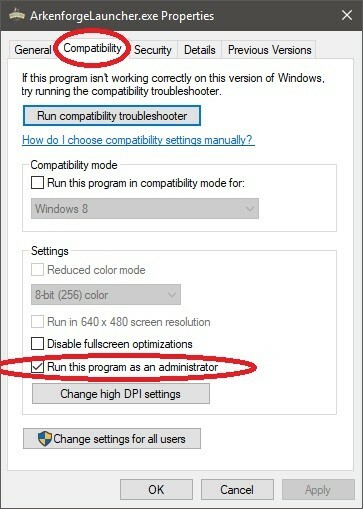 Depending on your instalaltion folder’s permission, you might have to run the launcher in administrator mode every time it needs to patch. How do I use Community packs ? 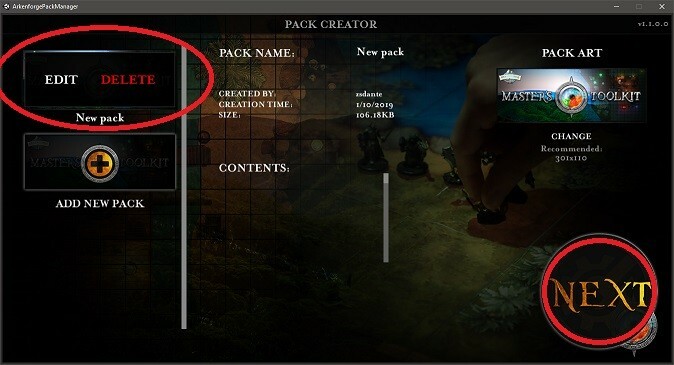 Once our pack is ready, we can import it via the Arkenforge Launcher. How do I upload/import audio to Soundscape ? 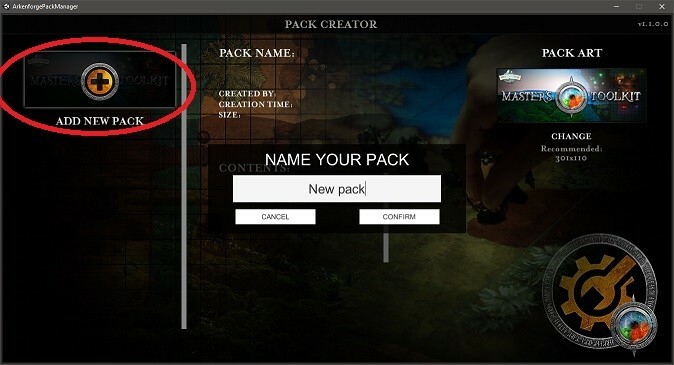 You will need to use the Pack creator to do so, which you can access via the main menu of the Arkenforge Launcher. 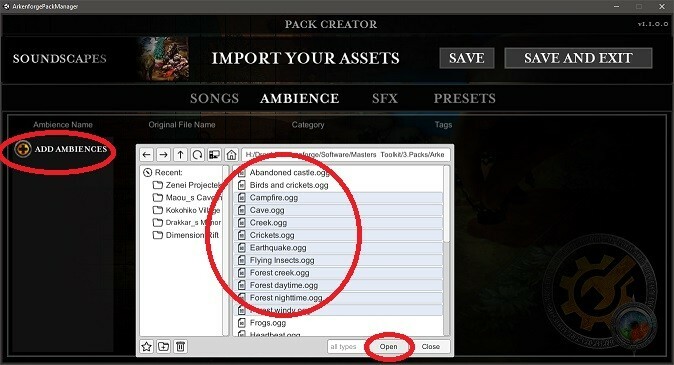 Please keep in mind that the Pack creator only supports .ogg or .wav files to import, so mp3/flac files need to be converted. You can use a free converter like this (Thank you Leigh Pierce for suggesting it!). You can check out this Tutorial video how to do this by clicking here! Naming multi-layered songs this way will automatically group them when imported! 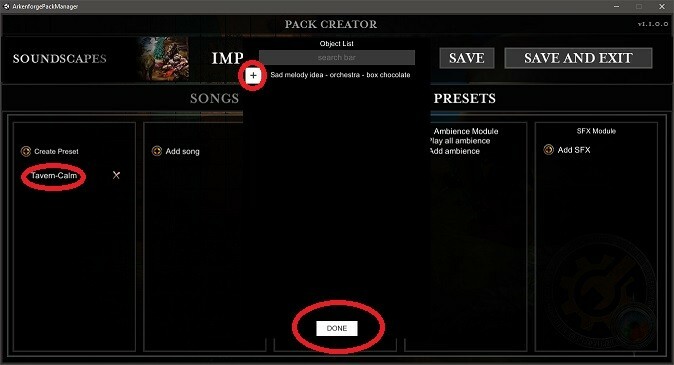 Step 5 : Optionally fill out the Artist name or add tags (separated by a comma) to your songs to be able to find them easier within the software. 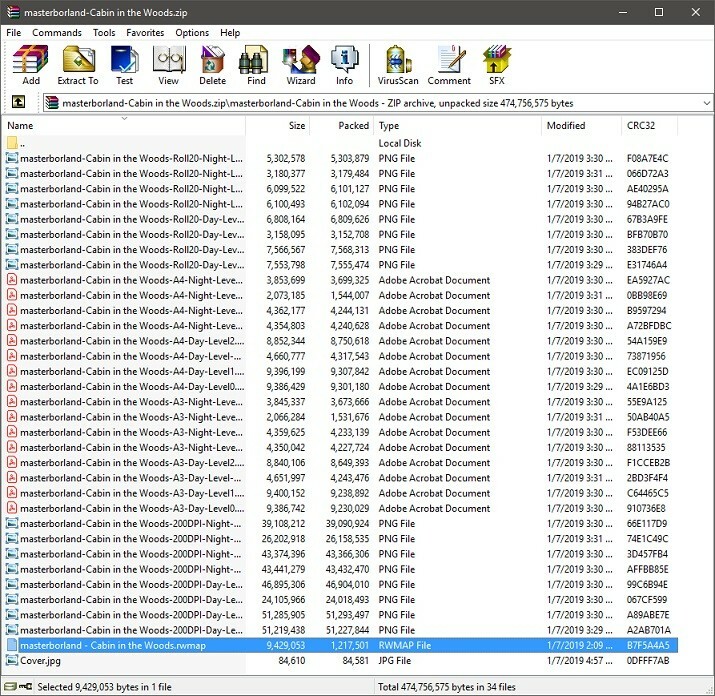 Click Save on top, and now the song is added to the pack. 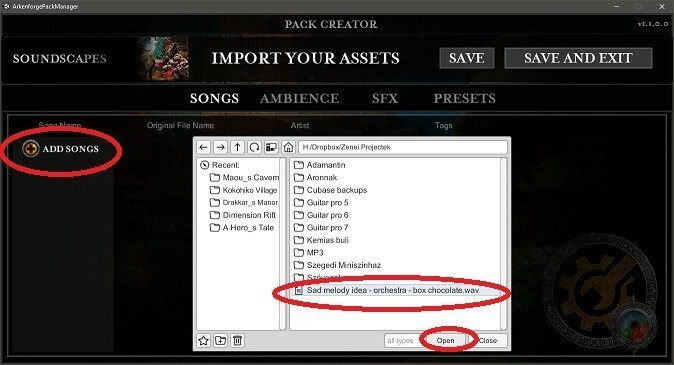 Scroll down to Import pack if you don’t want to put your song into a preset! 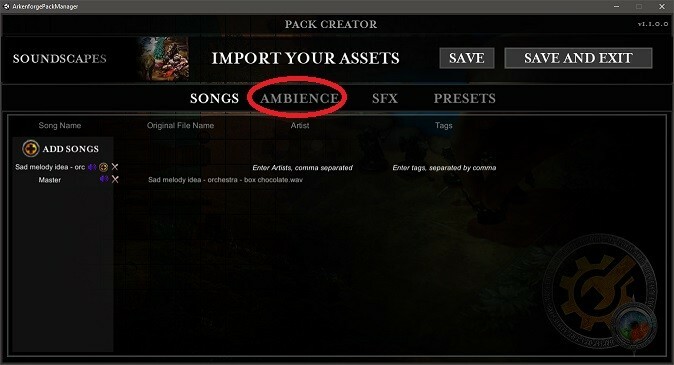 Ambiences are seamlessly looping audio files, to create different atmospheres to your game. These files also need to be in .ogg or .wav format! Step 3 : Optionally click on the Category boxes to fill out the categories, or add Tags to the ambiences (separated by commas) to find them easily in your library! Hit save on the top! 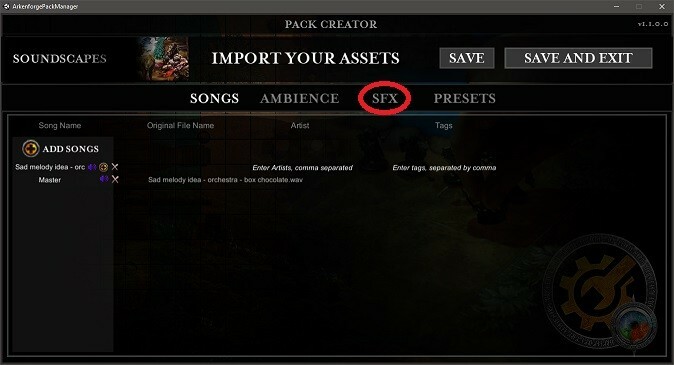 SFX’s are one-off audio files, to time and add to an ambience, or place it on the Quick access SFX tab of Soundscape. These files also need to be in .ogg or .wav format! Naming SFX this way automatically groups them at import, and ties them under one SFX button. 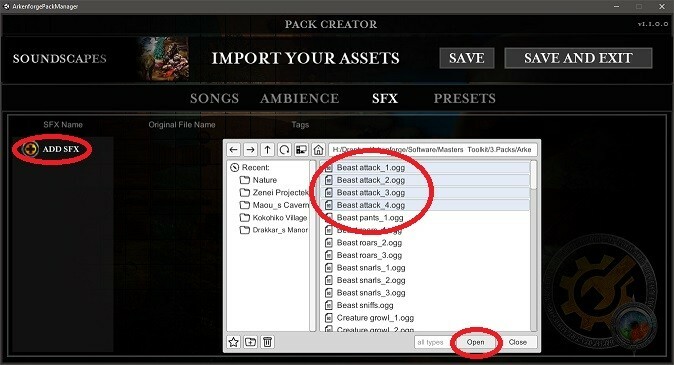 Step 3 : Optionally fill out the tags (separated by a comma) to find your SFX easier within your library! Click save! 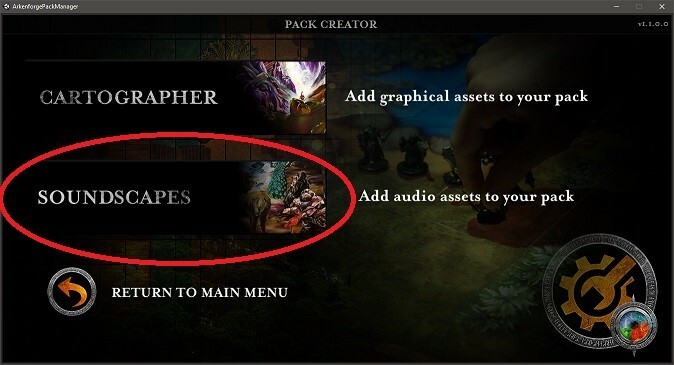 To have your presets tied into your pack and be ready for your session, you will need to create them within the pack creator. 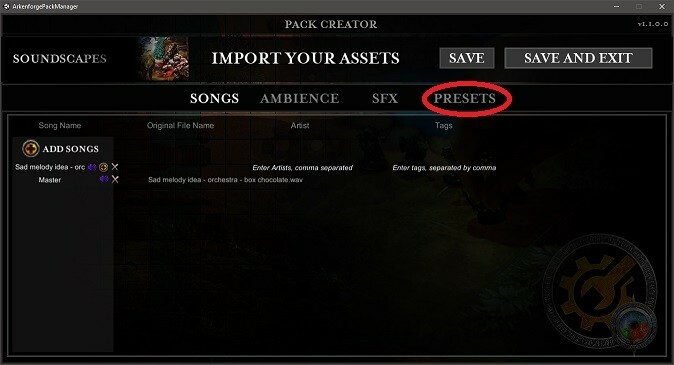 Click on the freshly created preset, so add song, add ambience, and add sfx buttons light up. 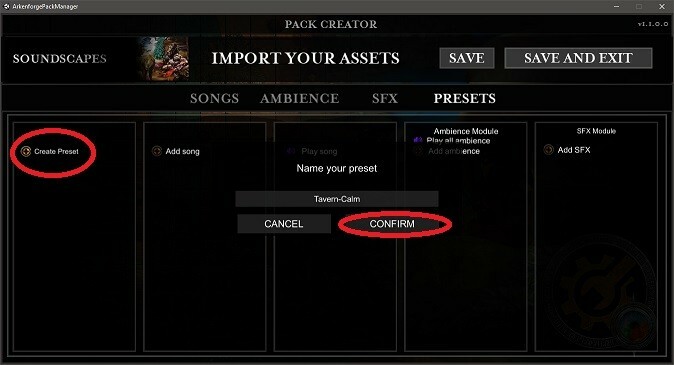 Now you are able to add sounds to your preset by clicking on those add buttons. To add a song for example from the library, click on add song, select the song and click on the plus icon next to the song name, then hit save. How do I uninstall the Master’s Toolkit ? 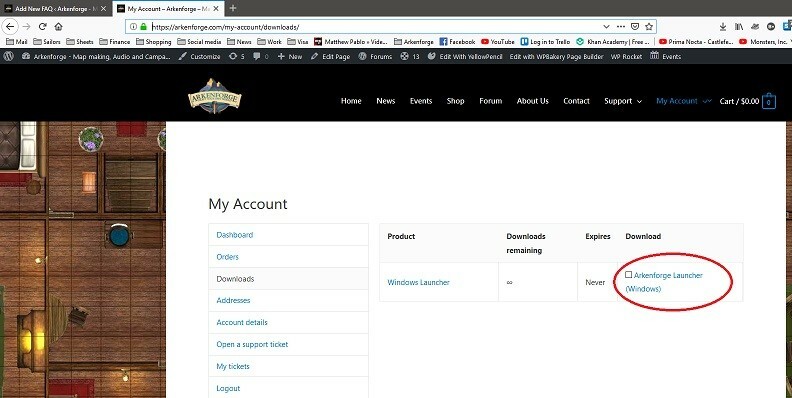 Step 1: Download and Install the Arkenforge Launcher, click here to know how! How do I repair the Master’s Toolkit ?